Communication is a two-way street, with a sender and a receiver. But if one relies on verbal language and the other on non-verbal language, challenges are bound to arise, making problems seem worse than they are. Is there something askew in the bond between you and your horse? Does it feel like you are not in sync? Did you try the old cowboy ways, but they drift you and your horse further apart, leaving the problem still unresolved? Looking for a better, more humane way? EquineFlow horsemanship is a philosophy regarding treatment of horses that goes beyond what happens in the arena. It is a system that sets you and your horse up for an enjoyable life together, with enjoyment being the keyword in all interactions, not just riding. It promotes a camaraderie between the both of you that is real, genuine, based on trust, connection and earned-respect. In EquineFlow horsemanship there is no harsh punishment; only strategic, forward thinking problem solving. Behavior (yours or your horse's) isn't labeled as wrong or right, but seen as an attempt to communicate. We use applied ethology, intuition and equine linguistics to translate horse behavior into verbal human language, to develop actionable strategies. We find solutions that truly work to promote safety, progress and enjoyment for both you and your horse, within the frame of your ethical feelings regarding horsemanship. Sounds like your cuppa tea? I learned a tremendous amount about the mind of the horse and the horse behavior in a way that we rarely get to hear about in America. 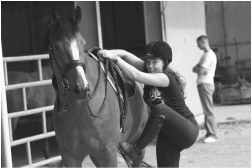 I learned to trust myself to remain calm and confident, and teach my horse there is trust." K.S. I can never give Monique enough credit. She lifted me out of the darkest time in my life, bringing true joy back into my equestrian life. Each lesson teaches me something about myself as well as about my horse. I never expected a riding lesson to incorporate psychological training as well as physical and mental, but now I understand that this strengthening of my own mind as well my horse’s has made all the difference." Sarah. W.
Discover how to find simple solutions to solve pervasive challenges with your horse in a way that is aligned to the new era of EquineFlow horsemanship. Typically we meet at your farm for the first visit. You explore goals and share what you'd like to get out of our time together. We meet your horse and set a benchmark. We analyze behavior, context, frequency, intensity to understand triggers, causes, roadblocks. You identify solutions that fit in with your world. Then you test them thoroughly. After each application you thoroughly evaluate what worked, what didn't and what needs to be tweaked. The entire process is calm, positive, productive and focused on confidence building for both you and your horse. There is no screaming, hitting, or yelling involved. Your horse won't be spun into endless circles or be pulled on a rope halter to teach him 'respect'. We are not grabbing harsher bits, bigger whips or draw reins to silence your horse, nor do we feed it an endless supply of cookies to bribe it into submission. Instead we look to science to explain behavior. We look at research for proven solutions truly addressing core reasons why your horse behaves in a way you find unsatisfactory. You discover what part of the challenge you face with your horse are 'yours' and what are 'his/hers', and address them accordingly. Learn to regulate your mind, to regulate the mind of your horse. Techniques combine scientific discoveries with thousands of hours experience in teaching, riding and working with a large variety of horses and riders. Solutions draw from proven animal behavior modification techniques, as well as from positive psychology, neuroscience and mindsight. 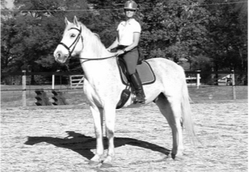 Expand technical skills and deepen awareness of your horse's psyche. Sharpen your intuition and learn how to feel when things are right. Learn brain-based technique to overcome obstacles and expand mental and physical fitness, both for your horse as well as for yourself. ​Now that I am working with Monique, there has been a drastic change in not only Quint's confidence, but also mine. I now know how to communicate with him in an effective, yet always positive way that always leads to results! I cannot thank Monique enough for how much she has changed the relationship that I have with Quint but also how I will forever look at training horses." Meghan H.
A horse guardian looking for real change? Looking for a humane, positive solution to resolve a challenge with your horse? How come you only do private sessions? Each rider and each horse presents a unique combination of strengths and challenges. Group sessions do not offer us the ability to zoom into the very details, so the results are not the same. During our time together we go into the very essence of who you and your horse are together. That's where the key lies to solving your challenge. Depends on the child. Some children are very interested in humane horsemanship. Others are more interested in the show aspect. For those who are really into showing, I am not a good fit. For the ones who are fascinated by the mind of a horse, who are possibly vegan or vegetarian, have ADHD, and who are in love with all things nature, I am a good fit. Do you offer horseback riding on your own horses? Or trail riding? I do have a haflinger and a welsh/shetland pony available for you to take horsemanship lessons with that could incorporate riding. Huck is 12.1 hands and is great for children up to 100lbs. Zen is 14.2 hands and is a good fit for smaller adults up to 175lbs. We don't offer trail riding. Will you ride my horse for me? Probably not. My speciality is teaching horse trainers how to train their horses through science and intuition, so they find their own solutions and develop 'feel'. If you want your horse ridden for you, I am not a good fit. Upon your request, I occasionally may ride your horse, for a very brief moment to help you tweak your problem solving strategy, but this is not a routine strategy. Yes, I do. First 20 miles around Greenville, SC are included. If you are farther away we find a solution that works best for both of us, such as cluster sessions or online sessions. Could I come to you too? Yes, we have our own private farm with a dressage size, fully enclosed arena with jumps and stone dust all weather footing, and you are welcome to trailer in. Do you offer trailer loading trouble shooting? How do horsemanship sessions differ from life coaching sessions? EquineFlow Coaching helps you improve your life in whichever area you desire. EquineFlow Horsemanship helps you improve the connection, communication and trust between you and your horses, helping you solve disconnects and conflicts. ​While there is some overlap, the main difference is that in MindTraining sessions you learn techniques to get intimate, comfortable and in control of your own mind. In Horsemanship sessions you learn techniques to get intimate, comfortable and in control of your horse's mind so you and your horse can resolve challenges better. EquineFlow horsemanship has helped hundreds of guardians of Quarter Horses, Appendixes, Paso Finos, Thoroughbreds, Dutch Warmbloods, Rocky Mountain horses, Tennessee Walkers, Haflingers, Morgans, Welshes, Saddle Breds, Fjords, Arabs, Friesians, Selle francais' to restore connection and get better results. Disciplines included endurance, dressage, trail riding, eventing, hunter/jumper, trick training, natural horsemanship, saddlebred, gaited and western pleasure. "For the first time in years, I am happy when I'm at the barn. I'm happy while I groom and while I longe and feed treats. I'm even happy while I ride, which for a self-critical and unconfident rider is something like a miracle. And I'm happy because my horse is happy. All the years that she was pegged as crazy or moody, she was just trying to tell me something. Monique taught me to listen. Thank you so much for all you have done for my horse and me over the past three years, and for believing in us when everyone else (myself included) had given up. You rock! " Margaret M.